SO much has been going on around my house that it seems cooking and blogging has taken a backseat, something I really hate. So you know that making a good meal (and a BUDGET meal) last night made me happy. My kitchen smelled wonderful and actually sitting down to a tasty meal was a breath of fresh air! This recipe is easy peasy! No stress, whip it together, and enjoy. It is a recipe for 4 but if you, like me, are cooking for two most of the time now it is a great recipe to give you leftovers. The chicken is so juicy and makes wonderful sandwiches or you could throw it in a nice soup with the leftover roasted veggies. When you break it down this recipe costs about $2.25 per serving so that is something else you can love about it! Place chicken on a rimmed backing sheet. Season the chicken inside and out with salt and pepper, sprinkle poultry season over the outside. Roast chicken in the oven for 25 minutes. Meanwhile in a large bowl toss the broccoli and potatoes with the olive oil, season with salt and pepper. 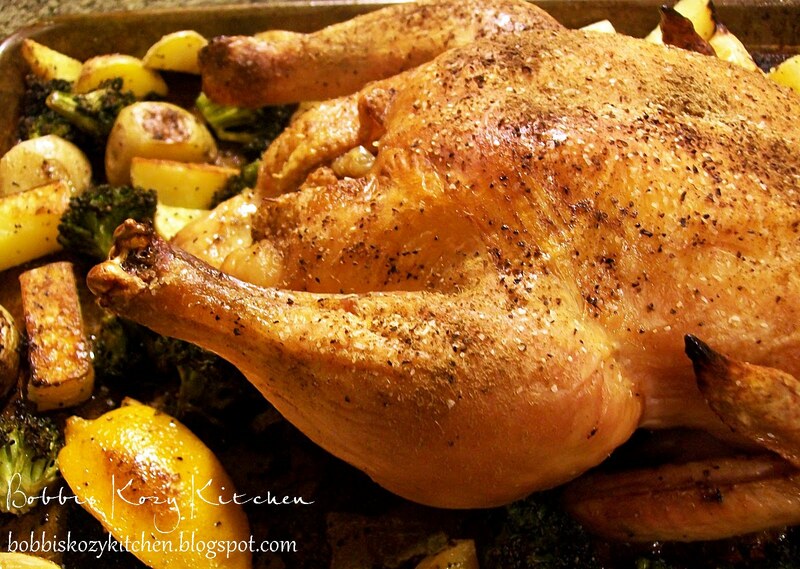 Remove the chicken from the oven and scatter the potatoes, broccoli, and lemon around the baking sheet. Sprinkle them with garlic powder and onion powder (amount depends on how strong you want the flavor, I used about a teaspoon of both). Return to the oven and roasted an additional 35 minutes turning the the vegetables after 20 minutes.. Chicken is done when the juices run clear when chicken is pierced between the breast and thigh (an instant thermometer should read 165 degrees when inserted in the thickest part of the thigh). Let chicken rest 10 minutes before carving.